Last year, Uppsala University’s Zennström Professor in Climate Change Leadership, Kevin Anderson along with colleagues Isak Stoddard and Jesse Schrage at CEMUS, calculated a carbon budget and associated emission reduction for the Swedish Municipality of Järfälla. The report, initally in Swedish, has now been translated to English. The original report in Swedish, along with a recording of the event where the report was presented can be found here. During 2018 we are planning a number of new activities, including a carbon budget project for Swedish municipalities, counties and regions, in partnership with the consultancy Ramböll. 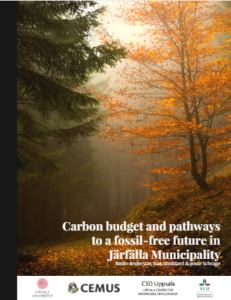 We work with municipalities, cities, regions, sectors and organisations that are interested in developing a carbon budget framework as a scientific underpinning to their climate and energy strategies. Centre for Environment and Development Studies at Uppsala Unversity and Swedish University of Agricultural sciences.